HVUT Form 2290 is due by Oct 31st for vehicles first used in Sep 2017. Hey there truckers, this article is to indicate that we got a near term tax deadline by Oct 31, only for the Heavy Vehicles which are operational on the road since Sep 2017. Despite that fact that how many days the truck was operational throughout the month, the HVUT would be due by the last day of the following month. 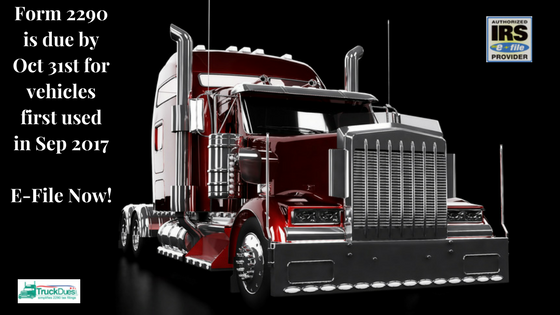 Since, Form 2290 is due on any vehicle by the last day of the month following the month of its first use. Well, only when you’re truck is going to be used over 5000 miles from the time you place the truck on the road up until June of the following year, you pay taxes on the vehicle on a pro-rated basis by reporting your vehicle to be a Taxable vehicle. (A Partial tax payment calculated from the vehicle’s first used month through June of the following year). This entry was posted in 2290 e-file, Agriculture Vehicle, American Trucking, Form 2290, HVUT 2017 -2018, Truck Tax Online and tagged 2290 e file, can form 2290 be efiled, e-file for form 2290 excise tax filers, Form 2290, Form 2290 Amendment, form 2290 application, form 2290 category w, form 2290 contact number, form 2290 download, form 2290 due, form 2290 e file providers, form 2290 exemption, form 2290 explained, form 2290 extension, form 2290 federal excise tax, form 2290 filing date, form 2290 heavy highway vehicles, form 2290 help, form 2290 highway use tax, form 2290 instructions 2017, form 2290 irs online, form 2290 july 2017, form 2290 late penalty, form 2290 renewal, HVUT, hvut 2017, HVUT 2017 -2018, hvut 2290, hvut 2290 due date, hvut amount, hvut cost, hvut due date, hvut filing, hvut form 2290, hvut form 2290 instructions, hvut form 2290 online, hvut instructions, hvut tax, IRS, irs form 2290 contact number, irs form 2290 due date, irs form 2290 e file, irs form 2290 instructions 2017, irs form 2290 mailing address, irs form 2290 online, irs form 2290 payment, irs form 2290 pdf, irs form 2290 questions, IRS watermark, is form 2290 filed annually, Late 2290, Late HVUT fees, Late HVUT payment, Owner Operators, Truck Licensing, Truck Tags, truck tax online, Truck Tax Online 2290 e file, Truckers, Vehicle Identification Number, VIN Correction, what is a form 2290, when is a 2290 form due on October 3, 2017 by Truck Dues.